E, no one deserves cancer of any kind. You saw the stats. 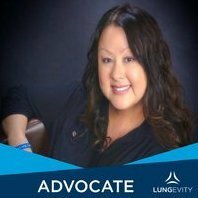 60percent of all LC are in non-smokers or smokers that had quit. No more punishing your self. I agree about the signature. I started out with "former cigar smoker" in mine, but edited it out. We know that both smokers and non-smokers get lung cancer and we don't care which you are. As Katie likes to say, we are cause agnostic. Good luck with your chemo and radiation. Ok this is what the treatment is. I don't know if it's the right or wrong one... I only know i have to do something. Jump on this coaster Monday 130. Okay, you gave us exactly what we needed to help you. I had both Carboplatin and Taxol too. I've read here where some folks did quite well with it. I found that on the 3rd day after chemo, I was uncomfortable enough to need Vicodin for muscle pain. But everyone is different. Make sure you get on top of the constipation. That can be an issue. Don't let it get ahead of you. You stay on top of it. As my treatments went, I noticed a metal taste in my mouth, which made eating unpleasant. Just eat, no matter how it tastes, as you'll tolerate the medications better, and you don't want to lose weight during chemo. I didn't have radiation, so I'm sure some others will know what that is and can advise you. My chemo regime was very effective, and I think it's a good one. Wishing you the best. Stay positive no matter what. It really does help one go through this. It won't be easy, but you can do this, I have no doubt. Eric - I have the same cancer and had the same treatment. I did just fine. Have been on a trial since treatment ended, but have remained stable. When it comes to cancer, stable is a great word. Eating was somewhat of an issue, but I found enough that I could eat that I gained 15 lbs! Judy is right on about the constipation - comes with the chemo I think, but you'll find lots of good advice on here. One thing I didn't do as well as I should have was drinking lots of water -- keeping hydrated is very important and will make treatment go better. I had carboplatin, taxol and avastin. I got increasing fatigued and nausea by the 4th, 5th, and 6th infusions. They gave me good meds but they didn't quite do it for the nausea. I had a script for phenergan but wish I'd had zofran. I asked for it with this chemo treatment and it's the bomb. No experience with radiation. I just want to be added to "team Eric"... we might call ourselves.. all out here sending positive vibes and prayers for much success in your treatment. You can do this , one day at a time and we will be out here cheering you on. Your fantastic attitude will take you far. Thinking of you today, Eric, and hoping that all goes well with your treatments. At least you will have the satisfaction of knowing that things are getting underway to enable you to better fight this battle. Keep us updated and positive thoughts for you and family. Hey Eric, you were on my mind this morning. Wishing you the best as you begin your treatments today. Try not to worry about it. You will be fine. If you experience nausea, or pain after two or three days be sure you have pain medication and nausea meds to help with that. Praying for a strong spirit and positive attitude for you as you begin this journey back to health! I am ding well with this chemo and radiation... THe preasure is gone and i no longer feel this tumor. had radiation 3X and chemo once and so far so good. no side effects yet but expect to experiance some sooner or later. Today i feel better than i have in months! A question to you find MOds? Do i need to stat posting in a different topic area? THis one is getting long. Hi ERic, so glad to hear you are tolerating everything well so far. Good! As far as modules go.....here's the scoop. You will find the regulars here post daily in the days "Air". So you'll go to "View New Posts" and if someone has started it for today, the title will be "Thursdays Air". In this module we just post about daily stuff. I do write about my health issues there because it's the most visited module. You can write anything you want in there. Well, you can do that in any module, but this one is the most used one. It is on the Board Index under Just for Fun - Off Topics. Another one that gets a lot of use here is Test Time - Updates. If folks are undergoing treatment, or tests, they frequently write in this one what is going on. It would be very appropriate for you to post in that one about your treatments and how it's going. Then there's the optimistic one called Lung Cancer Survivors. This is for any of us that are on this side of the dirt. We are survivors. And if you browse through that module, you can see the types of posts there. To see all the different modules, go to Board Index. You will see there's a myriad of different topics. The ones I gave you are the ones I've seen used the most. One other thing ERic. What I do each day is go to the top of the page and go to View new posts. That gives me everything that has been posted recently. I like to view them as it has allowed me to get to know the members here. I just click on each new post and if appropriate, make a comment to them to encourage, or just say HI! I had carboplatin, taxol and avastin. I got increasing fatigued and nausea by the 4th, 5th, and 6th infusions. They gave me good meds but it didn't quite do it for the nausea. I had a script for phenergan but wish I'd had zofran. I asked for it with this chemo treatment and it's the bomb. No experience with radiation. Good luck and keep us posted. Cytology report on fluid removed from lung after pleural effusion and pneumonia Sep 07 showed adenocarcinoma cells. Dx IIIb NSCLC Oct '07 at MDACC, Orlando. Fol 6 rounds Taxol/Carboplatin/Avastin and 2 Avastin, CT/PET 4/1/08 pleural thickening gone and no active cancer cells. 11/3/08 STILL NVED. CT/PET/MRI 5/4/09 Cancer back, still in the pleura and chest wall, small amt of fluid, all in left lung. 5/11/09 Start on Alimta every three weeks. 7/13/10 Had Alimta on road in Corning NY. 8/24/09 Scans show some improvement. Continue on Alimta. 9/14/09 Chemo on road in Mt Holly NJ. 10/6/09 Started regular Alimta infusions in Key West. 11/3/09 CT and PET scans showed significant improvement. Some issues already resolved. 2/3/2010 No evidence of residual or recurrent disease. NED! Stay on Alimta. 5/6/10 Am considering myself still NED until/unless proven otherwise in July. Rabid radiologist thinks he sees something suggestive of similar to some abdominal cancer. No light up on the PET. Am hoping for the best. Stay on Alimta and scan in 9 wks instead of 3 mos. Stephanie pointed out my name and profile seem to be popping up with someone else's posts: harper36, a new member who it looks like joined on Dec 13. Anyone have a clue? This last one dated Dec 13 with my name is a copy of one I did here in Oct????? I saw that Judy. There's definitely something going on with the site. I've been getting notifications on posts, only to click on them and it's old messages, months old. I'm going to PM Katie on this.